Ben Roethlisberger, quarterback for the Pittsburgh Steelers football team, will be wearing special cleats emblazoned with the Star of David during Sunday’s game against the Baltimore Ravens. The cleats are white, black, red, and blue with yellow Stars of David at the top and the words “Stronger Than Hate” on the front. 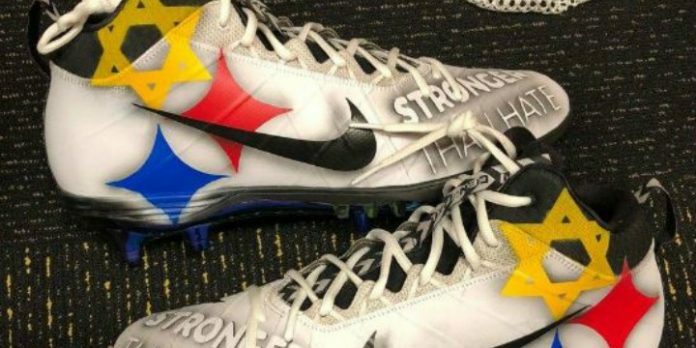 According to The Hill, Roethlisberger is wearing the cleats in honor of the victims of the Tree of Life synagogue massacre and their families. In particular, the quarterback is expressing solidarity with Michele Rosenthal, a former Steelers employee who also worked with Roethlisberger’s charity foundation. Rosenthal lost two brothers in the shooting. The Pittsburgh Penguins hockey team is also paying respects to the victims with patches on their jerseys. The jerseys will then be auctioned, with the proceeds going to the Jewish Federation of Greater Pittsburgh. In addition, the team held a blood drive for victims and raised funds for them and their families.